Miniature wireless ECG, respiration and temperature monitor…A step closer to the paperless practice. Go Wireless…Go Digital with Vmed Bluetooth wireless monitors. Bluetooth is virtually free of interference and is omnidirectional to a range of 100 meters, line of sight. Main controls except keyboard entry are at the patient’s side. Save space, eliminate cables and store files automatically. Vmed monitors link to your Windows desktop, laptop or tablet computer to display real-time patient monitoring waveforms and digital data on your computer screen. Monitor up to seven patients on one computer. Files may be retrieved for waveform analysis, transmission via email or printed in a concise report. All hardware, software and monitoring accessories are provided with our multi-parameter patient monitor and our ECG monitor as described below. Works best with Windows 7, 8 and 10 computers. Use in the exam room for pre-surgical screens and routine examinations. VetChek can be used in the exam room to screen for heart abnormalities that may cause problems before, during and after surgery. ECG screens add value to the initial and subsequent annual exam and often allow the practitioner to find defects that support follow on care. Dr. Larry Tilley, a cardiology consultant, states that no other diagnostic test, including ultrasound, can accurately determine the source of various arrhythmias and conduction abnormalities as is done with ECG testing. Lead II is all that is needed in most cases; you can do away with complex lead analysis, axis shifts and perfect positioning of the pet. “The majority of veterinarians can interpret their own ECG by simply focusing on the heart rate and the cardiac rhythm.” For difficult cases, the ECG printout can be emailed directly to cardiology-based services for quick and inexpensive interpretations to determine the necessary course of action. The handy contoured chest probe makes exam room ECGs a snap. By simply placing the probe over the chest wall, the three built-in electrodes produce a quick, clean signal. The fear of the animal patient getting tangled in wires and cables is no longer an issue either. A modest procedure charge provides excellent investment payback. Artifact suppression and low noise electronics offer the cleanest, most readable ECG trace possible. When this quality is combined with a virtually interference-free wireless connection to your computer, the result is an ECG system with a large screen display that can be easily seen from across the room. 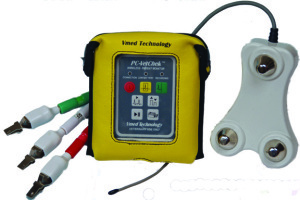 ECG rhythm strips are a snap with the unique Vmed chest sensor or use the included low force skin clips for diagnostic quality traces. ECG information, including clinic and patient identification, ECG trace, heart rate, chart speed, gain, etc. can all be displayed, saved to a file and stored on your computer without the hassle of downloading, all from the battery-operated, hand-held unit. (See the clinical papers page for a description of hand-held ECG in veterinary practices). 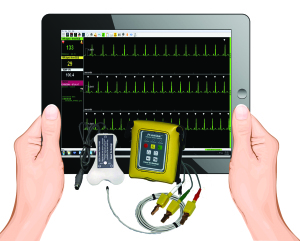 Available with or without ECG interpretation software. For surgery monitoring the PC-VetChek , when used with an optional esophageal probe, becomes a large screen patient monitor displaying digital heart rate, respiration rate, temperature as well as ECG and respiration waveforms. Fully programmable alarms and other settings are available in the PC-Display software. A protective hanging pouch can be mounted on the surgery table, accessory cart or IV pole. Bothersome monitoring wires and cables are no longer an issue in surgery.